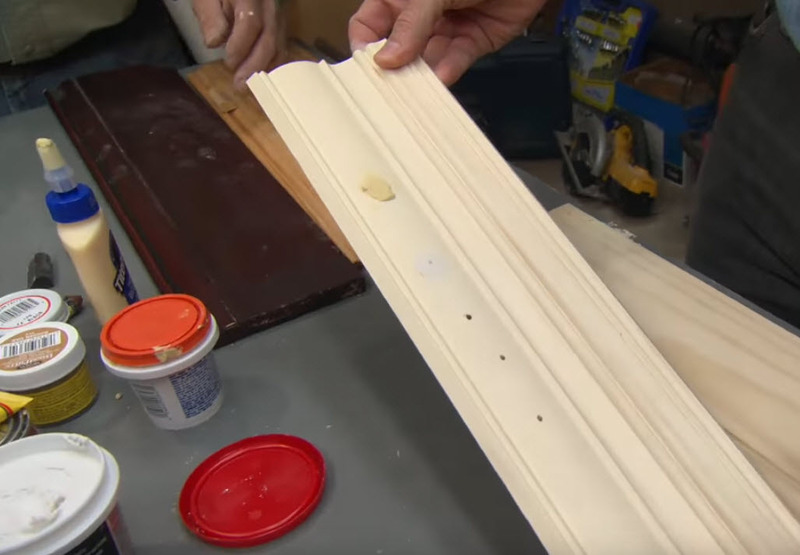 When it comes to fixing minor imperfections in woodworking or wood finishing around the house, it can be common to use a non-wood putty or filler to do the job. 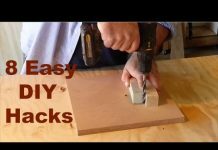 It might not be the best solution for fine woodworking where the end product is also seen as a work of art, but for those of us who need to hide minor inconsistencies in the wood project, these materials are life savers. One problem. Most people don’t know the difference in wood filler vs wood putty. Just given their titles they sound like they could be the same thing, just called by a different name. However, that is far from the truth. 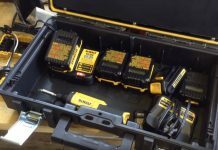 Accidental gouges in wood floors, scratches to cabinets, chipped furniture are all examples of issues that can be costly and time-consuming to fix. If you need to replace parts on them it could be more than you can handle by yourself. On the other hand, there is a very convenient material that anyone can use to fix these surface blemishes and make their wood around the house look good as new. Wood filler is a material used to repair any type of imperfections, gouges, or scratches in wood surfaces prior to finishing. Some water-based fillers can be applied after staining, however, these are typically not as resilient and can only be used indoors. They also aren’t recommended for items that are in high traffic areas as they aren’t as strong as their stainable counterparts. Solvent-based wood fillers are meant to fix any type of wood imperfection and can be used both indoors and outdoors. Once the filler is applied the piece will require refinishing. It is worth noting that filler is not a structural material. If the wood is damaged enough to compromise the integrity of the wood structure, then no amount of wood filler is going to help it maintain its rigidity. In this case, the broken parts should be replaced. Wood filler is quite easy and anyone can really use it. When you have a gouge or scratch in a surface it is best to clean it out as good as possible. If there are any loose particles in the gouge it can reduce the lifespan of the wood filler fix. Once the loose particles are removed it is a good idea to sand around the edges of the surface you will be filling. Clean all of the dust from around the area with a damp rag. Allow the area to dry before proceeding. You can apply the wood filler with a simple putty knife. Press the filler into the damaged area, using more filler than necessary so you can really press it into the affected areas. You can scrape the excess filler off with the putty knife, although it is a good idea to leave a little extra and not make the surface too smooth. Wood filler will shrink slightly as it dries so unless you want to fill a damaged area multiple times, do leave a little extra over the area the first time. Allow the filler to dry per the recommended time on the container. The surface will dry quickly, but depending on how deep the damage is, the filler deeper inside may still be wet, and touching it too soon will damage the repair. When everything is dry take some sandpaper and sand the surface down so that it is smooth with the surrounding surface. Once the piece is sanded down and all smooth, it is time to refinish the wood, as most fillers do not come pre-colored. If you have been fixing a piece that was painted, it is easy enough to paint over the filler to match the surrounding wood. However, if the wood is stained or finished with something else, it can be a little more difficult. Just using the same stain as you used previously on the wood may not have the same color effect on the wood filler. It is best to put some filler onto a scrap piece of wood and stain it with your color and wait for it to dry. Once it dries you can compare it to your original stained wood to see if you have a match. If it is too dark, the stain can be thinned down to make it lighter. If it is too light, you may need to choose a different stain to obtain your desired results. Unlike wood filler, wood putty is a non-hardening paste. It is mostly used after a woodworking project is already finished in order to fix any remaining blemishes. Typically you can find woodworks using wood putty to fix nail or brad holes, minor joint mismatches, or other minor imperfections. Where wood filler is used to fix larger problems, putty is used to fix very minor issues. Most manufacturers of putty have a number of colors that match the colors of their wood stains. This makes it easy to use the putty to cover up small imperfections once the project has already been stained. 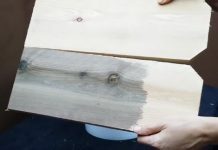 If you think you will need to fix some issues after you apply finish to your project, then you may want to use stain from a company like Minwax who has a variety of putty colors that match their wood stains. Wood putty is easily applied with a putty knife, or a finger if the area is small, such as covering a nail or screw head. You can wipe off the excess putty with your finger or with a damp rag and allow it to dry. As mentioned before, the putty will get more firm, but it will never completely harden. This allows the putty to expand and contract as the wood does in varying temperatures and humidity. 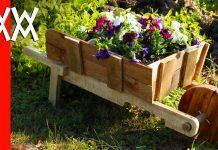 There a lot of uses for wood putty. Since it is applied after finishing, it can be used to finish blemishes on any type of woodworking project. Typical uses for putty are on outdoor projects and furniture. Since the putty never fully dries, it is flexible enough to move with the wood as it expands and contracts in the temperature. This is good because outdoor furniture will see a large difference in temperature during a sunny day to a cold dark night. Wood putty uses also include filling small holes. 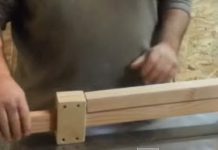 While some woodworkers try their best not to use nails or screws and use glue to hold their projects together, others prefer to use fasteners because of their ease to use. They also make building a project much faster as you can keep going without waiting for the glue to dry. These fastener holes are a problem if not filled. They are easily seen by anyone looking at the project and for the furniture to look clean, the holes must be filled. Wood putty is here to save the day and will easily conceal any small holes to match the surrounding wood.